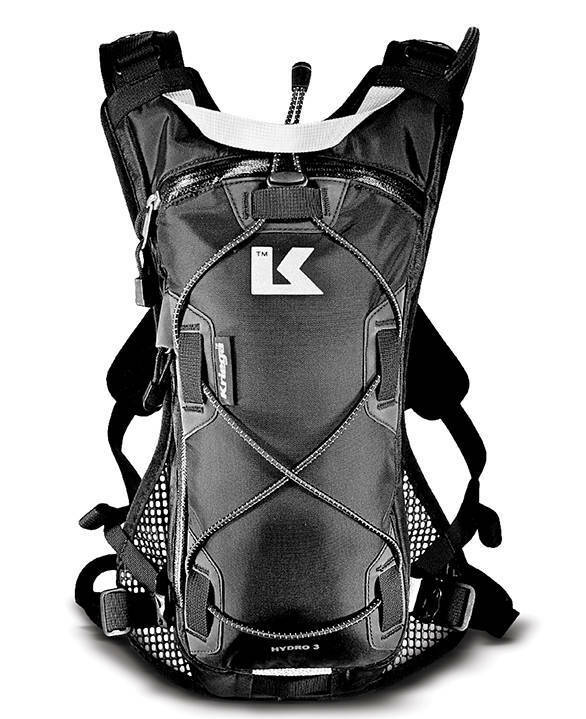 I discovered that long-distance riders and off-road riders both tend to use hydration systems, colloquially called camelbacks after the most prominent brand in the hydration pack business, Camelbak. Since then, I've bought and used two separate 3 litre bags. I'm an addict. I can hardly ride a motorcycle without the fancy water bottle anymore and if you started using one, you'd see why within a ride or two. The whole point of these water bottles with a drinking tube that ends in a valve is for you to be able to sip water on the go. So you should be able to drink water while you're riding, running, trekking or practically any other activity. The bag I have today is considered to be one of the best in the business. The bag itself is made by British motorcycle luggage specialists Kriega and the bladder, tube and valve system comes from Hydrapak, who famously supply their wares to the US military. The Hydro-3 is their hydration bag. Unlike almost all of Kriega's other products, the Hydro-3 isn't made to store things or carry things. The main zippered compartment has a plasticky inner coating to keep any condensation from cold water contained and it's filled entirely by Hydrapak's 3-litre reservoir. In front of the bag is a vertical water-resistant zipper that opens up a slim pocket that's as wide and tall as the main compartment but has no height at all. Outside, of course is the shock cord arrangement that serves as a place to stash small, light things. The other side of the bag has Kriega's usual generous mesh layer to allow wind to reach your back and the slim straps incorporate reflective patches, generous length adjustments (without any flapping ends) and Kriega's Quad Loc Lite branded mounting system. Kriega also supplies a quick release buckle and webbing strap to go across the waist. Kriega likes to use premium materials - and their prices reflect their well-made, premium, 10-year guarantee ethos. So the high wear areas have Hypalon (think Zodiac boat material), all the nylon is ripstop by default, the buckles are ITW (some of the best in the business) and so forth. Kriega also builds modularity into their gear and so the Hydro-3 is designed to accept their waterproof 5 litre or 10 litre bags (US5 and US10, respectively) to allow more cargo room should you need. Both the US bags, of course, have to be purchased separately. The bladder is made by Hydrapak and is the same spec and colour as their military spec line. It's a rectangular bladder that uses a unique closure system. You fold the hard top edge of the bladder plastic and a hard plastic rail slides over the fold to close the bladder off. The rail has a space on top so that you can velcro the top of the bladder to the main bag to stop it from sagging inside its compartment. First, the fit. Like all Kriega backpacks, the fastening across the chest appears significantly overbuilt compared to the usual sternum straps. But once you sit on the bit, their bags seem to sit on your hip and the weight is on your chest and off your shoulders. This happens to the Hydro-3 as well. And it makes riding with 3kg of water on your back very, very easy. More to the point, I never used the waist strap at all and once properly cinched down, the Hydro-3 stayed precisely in the middle of the back and never moved. Kriega says their gear is designed for motorcyclists and it's hard to disagree with them. Problems? The button you press to release the chest buckle can be hard to operate with gloves and on really fast bikes, the elastic retainer on the lower part of the strap isn't enough to stop it from flapping enough. I also imagine that still more reflective elements on the bag would be good. The vertical stash pocket isn't very spacious by design, it allows the bag to be very low profile. Which is useful if you've got a big bag mounted behind you. The pocket takes my iPad Mini and maybe a 10,000mAH battery at best. It hasn't let in any significant amount of water but Kriega doesn't claim it to be waterproof so I'd err on the side of caution and waterproof any electronics before I stash them in there. The shock cord works well too. The bag looks just as nice without it but I've learnt to leave it on. I ferried my Triumph's screen to the garage with unexpected success. The screen and its mountings were an odd, unweidly, shape and the cords kept the bits just so on a bumpy 17km ride. During the rains, the shock cord is where my rolled up waterproofs are usually stowed. The Hydrapak reservoir, similarly, is excellent. The valve lasts forever and it supplies a strong supply of water with very little effort. The tube integrates insulation - a neoprene sleeve is more common, more fiddly and less effective - and that works well too. The valve includes an on-off switch and the other end of the tube connects to an auto shut-off connection on the bladder. Which again, works well. You can unplug the tube even if the bladder's full without any leakage. The only problem is that if the tube gets pulled and the connector unplugs even slightly from the bladder, the water supply stops dead. Finally, the bladder mouth is wide so it's easy to clean, the closure is secure and unlike the rotating caps which use o-rings, age does not make it harder and harder to use. Better still, replacement bits, like valves are extremely cheap, though you'll have to buy from an international online store. Let's be honest, this is an excellent product with very few real issues. The chest button can be hard to press to release the harness wearing gloves. The water tube stops supplying water even if it gets slightly loose on the bladder connection. And obviously, the Hydro-3 has little or no cargo capacity built in. Kriega sells the Hydro-3 off their UK site for GBP 85 or roughly Rs 8,500. That's a lot of money for a water bottle no matter how fancy it gets. As luxuries go, the Kriega Hydro-3 is an excellent bag with almost no flaws. However, we're lucky, Triumph Motorcycles have a tie-up with Kriega and Indian Triumph showrooms sell a Triumph-branded Hydro-3 here. The sole difference is that the reflective K logo on the bag is replaced by the Triumph logo. And that is priced beautifully - Rs 5,500. That still seems high until you start looking for 3 litre bags from good brands and see that they're all in the Rs 4-6,00 bracket. In this light, the Hydro-3 is an excellent hydration system for an excellent price.